outdoor activities. Eggs are GMO free. and enjoy feed for active hens. Eggs are GMO free. fed with nutritionally valuable feed. been grown under the Finnish sun. Our eggs are laid in vital Finnish, family owned farms. Our egg production is 100 % traceable, salmonella free, non-hormonal, non-antibiotic and we use only responsibly produced and environmentally safe soy albumin. In Finland we care about the environment, animal welfare and customer satisfaction. Shell eggs are a fabulous natural product, but we also produce other great egg products for the food industry, bakeries and catering. We offer our customers eggs and egg products all from same place. In the summer 2015 Munax was granted the internationally noted FSSC 22000 Food safety certificate. 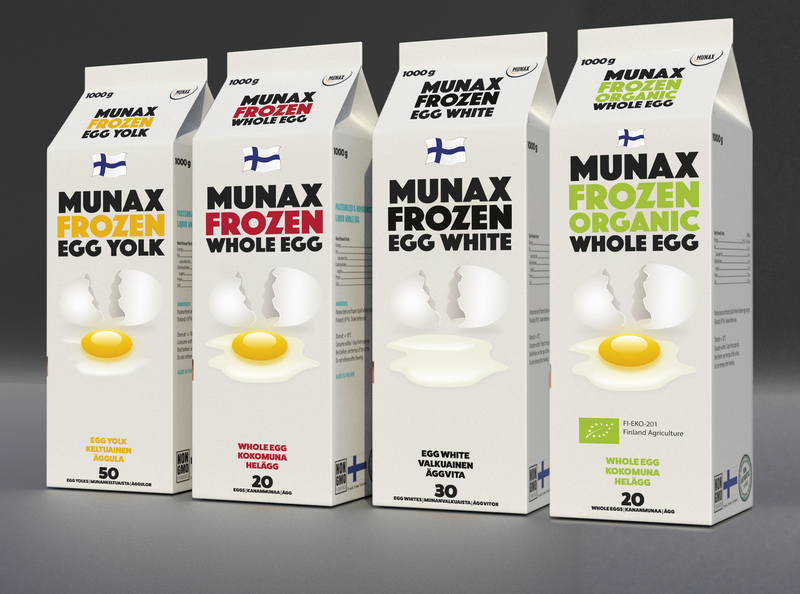 Quality egg products made in Finland guaranteed salmonella-free. Products are ready to use. By using our egg products, our customers save time, money and hassle without compromising the good quality. We can supply in range of packaging from 0,5 liter to 1000 liters. Packing options: gable-top cartons, bag-in-box and Pallecon containers. Custom made mixes for special needs.